Riding with proper clothing is mandatory at Winterfell Stables to ensure maximum safety and comfort. 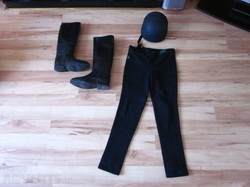 Riders must have boots with a quarter-inch heal, long pants, and a riding helmet (rentals available). We encourage friends and families to watch lessons to celebrate rider's achievements. As long as you are wearing closed-toe shoes (no sandals or flip-flops), you are permitted to be around the horses.